Are you considering building a catio or cat enclosure? Spring and summer are the perfect time to treat your cats (and yourself) to the fresh outdoors. 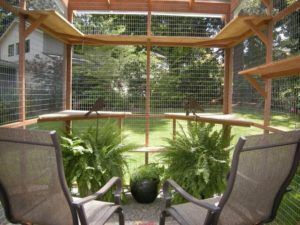 No matter where you live, a catio is a fantastic addition to most living spaces. If space is limited, catios can be smaller, cat-only window boxes or built narrow and tall for urban environments. 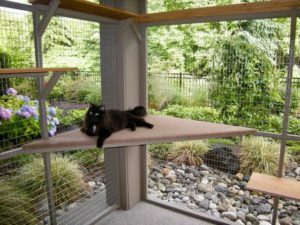 Larger enclosures can also be built to create a purrrfect hangout spot for both you and your cat to enjoy in your back yard. Where should I build my catio? Catios are extensions of your living space. How much outdoor space do you have available? Will your catio be against your house, or do you want the catio out in the yard, connected by a tunnel? Understanding where your catio will go and the size appropriate for your cat and your living situation are key. How will my cat get in and out? There’s plenty of ways for your kitty to go from inside to your outdoor catio. A cat door in a window, wall or door are all feasible options. (Check out a few we’ve built.) Ask yourself: Which works best for your home and your cat? Will it need to lock? Are there times you may want to keep your cat inside only – like on July 4 for the fireworks? 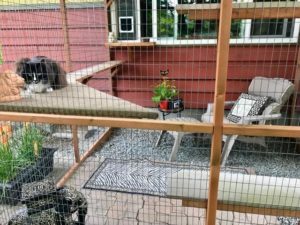 Do you want to enjoy the catio with your cat? Our larger DIY catio plans include a human size door and plenty of space. There are options for all sorts of catios, pick whichever entry and exit method will work best for your situation. What should I build my catio on? Should my catio include shelving, ramps or stairs? Should catios for younger or senior cats be different? If your cat is a senior, think about a ramp to ease their access route in and out of the catio. If they have arthritis or any mobility issues, plenty of lower-viewing places work well when paired with an exterior bird feeder for your cat to watch. On the contrary, if you have a buoyant kitty full of energy (at whatever age), lots of play room, shelving to jump on and fun objects to bat at within the structure may be ideal. What plants are best for catios? An excellent addition to any catio, plants add beauty and a touch of nature, but you need to be sure the ones you pick are ok for your cat to nosh on. There are plenty of non-toxic, shade and sun-loving plant options that can work in whatever climate you live in. Check out some of our favorite cat-pleasing plants for your catio. How should I decorate my catio? Remember, your new catio is not just for your cat. (It’s an extension of your space too, especially with our Sanctuary catio plan.) When decorating, add things for your enjoyment as well! Are you a reader? Why not include a cozy patio chair and table? Consider an outdoor rug, a water fountain or wall décor to make the space feel like a garden room. No space in the house for your man cave? Why not a man cave-catio combo? What’s the best cat-friendly catio decor? Always include a shady spot for your cat such as a covered dome structure, a bench to sit under or canvas on a roof section of the catio. 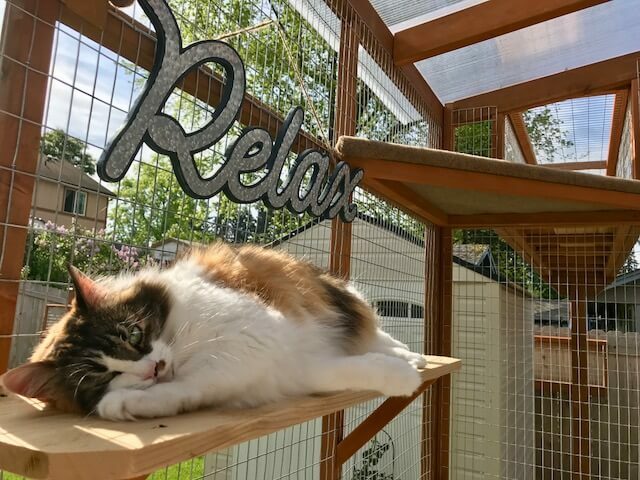 Consider adding a cozy bed, a cat scratcher, toys, tunnels, hanging things your kitty can bat at and a bird feeder outside the catio (your cats and the birds will thank you), There are endless ways to keep your kitty’s brain and body active and healthy. 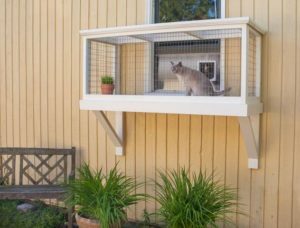 Consider what your cat loves to do inside and make it as easy as possible for her to do the same – even more often – in your catio. DIYing your catio is easy when you’ve given the logistics enough thought and planned ahead. Trust us—your cat will thank you for being such a great cat parent and you’ll both get years of enjoyment. 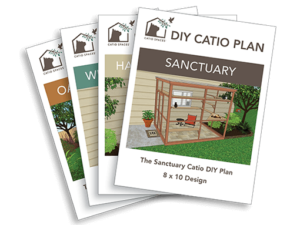 Don’t have a DIY catio plan yet? Consider one of ours! And meet some happy cats and cat parents who solved their indoor/outdoor cat dilemmas with a catio!